Valentine’s Day is one of those funny holidays that everyone celebrates in vastly different ways. We both feel like the most important thing is showing your loved ones that you LOVE them in whatever way works for you. Jodi likes to make heart pancakes and pink milk for breakfast, decorating the table in red and pink with little goodies. Julie pins hearts up on the wall and her boys get to take one down each hour and read the backs which are full of reasons that she loves them. We’ve posted in the past about a Valentine’s gift idea for your spouse that works in an office. It’s a thoughtful gift that can be put together fairly inexpensively but really shows that you care about them. Well this year we decided it would be fun to do a similar thing for our KIDS. Depending on your school rules and the ages of your kids you may want to adjust this list to fit your needs. Also, you will need to have some conversations about where this will be kept and when it is appropriate to break into the supplies. 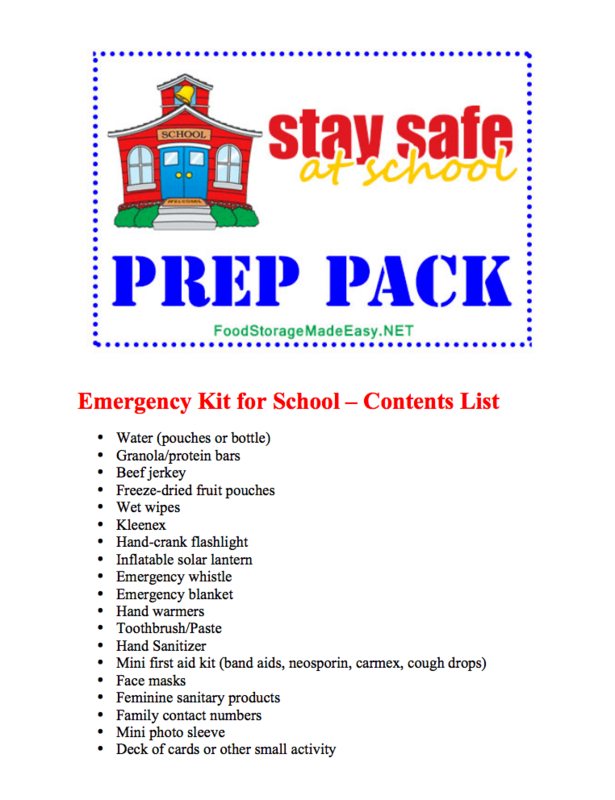 All items should fit into a gallon zip-lock bag which can be stuck in a locker or kept in the bottom of a backpack. Printable contents list and gift tag can be downloaded here. Laminate your contents list and include it in the bag so that you can remember what needs to be included in case the kit gets “raided”. Cut out the tag and tape it to the front. You can wrap it or set it out with cute Valentine’s decor to give it to your kids on Valentine’s Day. Even big “kids” will appreciate the gesture and feel a little more comfortable knowing they have some supplies in case of an emergency (big or small). We don’t want to scare them … we want to empower them. Side note: If you are working on your Monthly Preparedness Projects we emailed about last month, this will work for your February project so you can kill two birds with one stone this week!